In medtech today, the term can mean anything from a simple sensor-enabled activity tracker to a highly sensitive neural device communicating with a paired brain implant. The rapid growth of the wearable market comes at a time when consumers demand technology advancements – device miniaturization, extended battery life, remote charging capabilities, and increased data collection and sharing. These advancements can directly support the shift in patient care towards home-based treatment, helping to reduce hospital time and increase patient safety, accountability, and enablement. The history of wearables can be traced as far back as the first watches in the 1500s. More recently, hearing aids, pacemakers, and insulin pumps have framed the wearable medical sector. With today’s advancements in technology, wearables are exploding onto the scene – tracking everything from heart rate and blood pressure to sleep patterns, calories burned, biochemicals released, and so much more. Add to this the recent demand for alternative delivery methods of large volume biologics, and wearable devices are being aggressively implemented by medical product developers across the industry. Healthcare is moving out of the hospital and into the home. And this new environment brings with it a whole new set of medical device users. Whether it be a patient or a family member, untrained caregivers need devices that are intuitive, easy, and safe to use. Whereas medical professionals are trained on each device they use at work, at-home users are a diverse breed in terms of previous experience, instruction comprehension, and mobility/dexterity. Designing with clear input from a risk analysis helps new devices mitigate user error, which is a clear and present danger. User Failure Mode and Effects Analysis (uFMEA): Conduct a uFMEA early to identify user tasks that could cause harm if performed incorrectly. Work to address these parts of the workflow with product features, training, quick reference material, or industrial design, and assess the efficacy of your solutions iteratively with formative use studies. Wearables come with a higher responsibility for managing errors, and developers should err on the side of underestimating the user in order to mistake-proof their device. As with any product, it is imperative for designers to understand not only the user, but also the use case. A device in the field might be used by a patient, a family member, a trained medical tech or nurse, or some combination of the three. Will there be cases in which a single device will be controlled by multiple users simultaneously, or over a short period of time? If you are considering a connected device, how will the product manage the potential for multiple connections? These use cases can dictate important decisions like the selection of a wireless communication protocol. Use Studies: Conducting use studies can be invaluable toward identifying which parts of your product are working, and which areas still require improvement. There is no better way to assess workflow (in both the intended and unintended forms) than putting your product in front of your target audience. In the oftentimes wide user base associated with wearables the user can be a less-defined entity, so it is critical to recruit a representatively diverse group of use study participants. Encouraging your use study participants to evaluate wearing the product also helps to identify potential user perception issues. On one recent project, we provided participants with several basic space claim prototypes of varying sizes to wear and assess. Getting participant feedback on the prototypes prior to doing the detailed product design gave our designers insight into the ideal size/shape of the product, as well as which direction to grow the device if it were to become necessary to deviate from this ideal form. When designing a wearable device, many questions guide high-level product decisions… decisions that trickle deep into technical design. Here we touch on just a few of the most impactful questions that drive wearable device architecture. Where on the body will the device be worn? 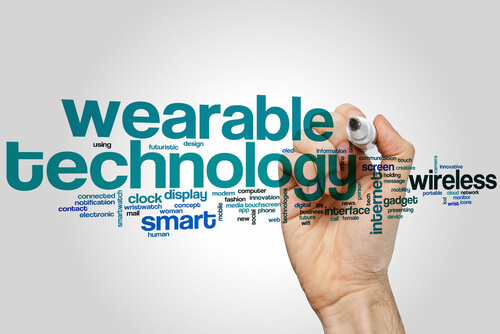 Wearables can be attached with an adhesive, mounted to clothing, or worn like an accessory. Determine which device components need to live on the body, and which do not. Consider whether the attachment site is compatible with the workflow – Does your device have labels or indicators that the user will need to be able to see while wearing? Will the user need to reach any buttons to interact with the device? What body part will they use to do so? Is orientation important, as is often the case with fluidic products? If so, how can we mitigate issues with bubbles? The duration that the user is expected to wear the device can also impact the desired location of the wearable. In some cases users may resent wearing a device for a long time if it is in an uncomfortable or highly used area of the body. That said, if the duration the user is intended to wear the product is too short, they may be inclined to hold the device as opposed to wearing it as intended. The ideal wearable minimizes both the burden of donning the device as well as the burden of wearing it. How will the device be powered? Unlike many other medical devices, most wearables use batteries to allow the wearer to move around freely. Although batteries seem commonplace in today’s technology landscape, the level of effort that goes into battery analysis and integration should not be underestimated. Whereas wall power is reliable, batteries have the potential to completely discharge, which can have dire consequences in medtech applications. It is important to characterize the required battery capacity and typical current draw conditions to provide the user with low-battery information in time to remedy the situation. The other half of the battery challenge is charging. Will the device have a standard charging cable, or a product-specific charging dock? If you are using a standard charging cable (USB or similar), what error cases could occur if the user uses an unrated cable, or connects the product to a non-approved device? If you choose to develop a charging dock, what are the consequences if a user misplaces the dock? Further, charging the battery will require connecting the device to AC power in some situations, which brings about an extra layer of patient risk (HHC standard vs 60601 standard). Where other medical products that use AC power (for instance, diagnostics devices) never come in contact with a patient, the impact of a potential electric shock is much greater in the case of a charging wearable. Electronics must be designed with this in mind. From targeting a wide range of lesser-trained users, to pushing the limits on battery technology and power monitoring, the wearable product landscape presents a unique and exciting set of challenges to Key Tech’s design space. In designing such integrated user-driven products, it is important to identify risks early, conduct formative use studies, and continue to test throughout the full product development lifecycle. All in all, wearable product development requires an extra level of mindfulness in the already challenging world of medtech design. Have questions or need support in designing a wearable? Contact us at talktous@keytechnic.com or 410-385-0200. Melanie is a Mechanical Engineer and Project Manager at Key Tech, and a graduate of University of Maryland. Since joining Key Tech in 2013, Melanie has earned her stripes by designing mechanical user interfaces, microfluidic disposables, and electro-mechanical devices for medical, industrial, and consumer markets. Melanie has a real knack fur data analysis and loves to sink her teeth into the statistical challenges that can drive product design decisions. Outside of work, Melanie enjoys painting, playing volleyball, and scratching carpeted posts. Needless to say, Melanie is a great choice for any design team.